You can parse the Miami Heat’s rather vanilla offseason a few ways. The more negative among them presents the image of a franchise with their feet firmly cemented into the ground, unable to progress forward after a drastic miscalculation in the summer of 2016. Then, there is a slightly more tempered view, accepting the notion that maybe the Heat brass simply believe this team can compete at an acceptable level while the league waits out an insurmountable Golden State Warriors reign. But the most positive among us, those who think this is all part of the Heat’s plan and the deliberate slow-playing of the market was calculated perfectly, now have something to boost their optimism. The Athletic reported on Saturday that Jimmy Butler is scheduled to sit down with Minnesota Timberwolves head coach and president of basketball operations Tom Thibodeau, as well as general manager Scott Layden on Monday to discuss his future with the team just a week before training camp is set to open. According to the report, the meeting is the culmination of months of stress between the Wolves star and teammates like Andrew Wiggins and Karl-Anthony Towns. Butler has already rejected a four-year, $110 million extension from the Wolves (he can make much more next summer as an unrestrcited free-agent), and a divorce appears to be the foregone conclusion barring an answered prayer from the Wolves brass. Thibodeau has spent much of his Minnesota tenure reuniting the band from his Chicago Bulls days, but it appears the lead singer has other ideas. Making things more complicated for Minnesota is the report that Towns will not sign his extension until Butler is moved. With Butler playing the part of distracted boyfriend in your favorite meme, the internet will scramble to assemble a list of potential destinations for the 29-year old All-Star. In the last few days, we’ve already heard he’ll eventually end up in New York alongside Kyrie Irving. Of course, the Philadelphia 76ers, Boston Celtics and the Los Angeles Lakers are mainstays among the crowd desperately hoping a viable challenger to the Warriors emerges out of the rubble. But the Heat, moreso than in past disgruntled star sweepstakes, should be taken extremely seriously. Few NBA players have had their paths cross more than Dwyane Wade and Butler this offseason. There was the Wade Invitational in California where the two worked out and drank wine along with fellow Heat forward Justise Winslow, as well as Donovan Mitchell, C.J. McCollum, Jahlil Okafor and others. 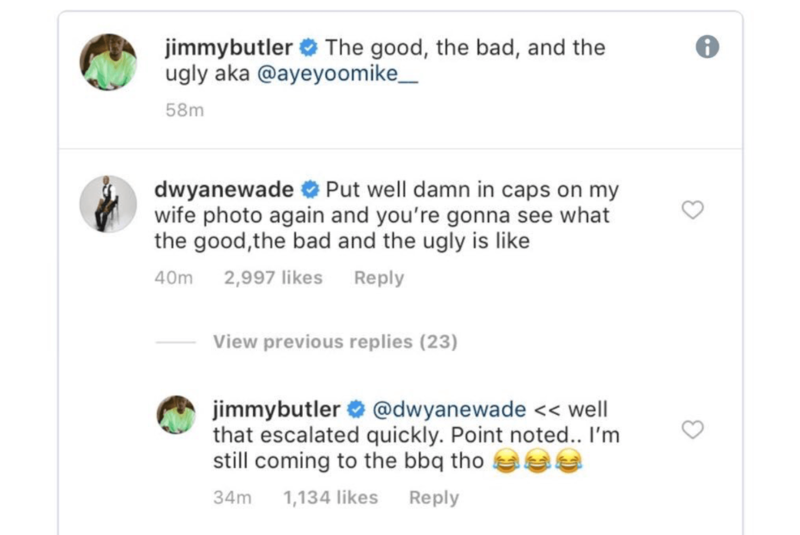 Then, of course, the fake scandal when Wade caught Butler pining after Gabrielle Union on Instagram. They’ve also been spotted doing karaoke and otherwise enjoying their summer vacation. So with Wade’s announcement of “one last dance” with the Miami Heat (Butler chimed in with an Instagram post of his own, calling Wade’s farewell tour “one helluva dance”) and his storied 16-year NBA career, what a franchise handoff it would be if Jimmy Buckets morphed into #BiscayneBuckets for his friend’s last trip around the sun, ensuring the team and city where Wade etched his legacy into NBA history forever was in capable hands moving into the future. There are logistics to this, of course. The Heat would obviously have to trade for Butler, assuming the Wolves decide that’s the best course of action for their respective future. There are financial scenarios that need to be worked out, and of course, the potential long-term commitment the Heat would desire from Butler. Make no mistake: Jimmy Butler is the caliber of player the Heat can and should pursue. He’s a player that can unlock a new potential for both the offense and defense, fast track the youth on the roster and become a crucial recruiting chip to someone like Kyrie Irving. But for an offseason that yet again produced more questions than answers, the Heat staking claim to the next era as they usher out the man responsible for the greatest period of success the franchise has ever seen would be cause for rightful optimism. I like Jimmy but hes not really a superstar. If there is someway Justice and JRich are kept I would do it in a heartbeat.